Q?What happens during an energy counseling session? +The format of our energy counseling sessions can vary, and are really dependent on what you want them to be, but here is a typical format for an energy counseling session. This part of the session has the feeling of a clinical psychology session. Beyond conscious discussion of whatever is concerning you, this helps bring the energy of your emotional baggage to the surface. We don’t pretend to understand the quantum mechanical details of how this is working, but what we know is that conscious recognition of a blocked emotional energy helps prime it for release/clearing. After discussing the areas you want to focus on, we’ll either put you up on our comfy massage tables or, if you’re interested, into one of the floatation therapy tanks we have access to through our partnership with Oly Float. While in a relaxed state, we use applied kinesiology to get to the energetic roots of the issues concerning you. This can take a little time, as we ask a lot of questions. These questions are being asked via muscle testing (applied kinesiology), so you don’t need to do anything at all other than just chill out for a while. When we’ve identified the origins of your areas of concern, we use a combination of electromagnetic stimulation of your governing meridian and/or reiki to perform a clearing, or release, of the blocked energy. The things we look at during this testing phase can be quite extensive. Emotional energy blockages, persistent core beliefs, cording from others, chakra health, magnetic field strength, spiritual embodiment, organ health, past life influences, ancestral inheritance, and lots more. We also check on the energy of very physical-level issues, such as the presence of toxins, pathogens, microbial infections, chemical sensitivities, nutritional imbalances and allergies. The techniques we use can really explore information about all facets of your physical and energy bodies. After you’ve returned to the waking world – our clients often fall asleep on the massage table, as the energy work can be deeply relaxing – we review with you what we found. As with the first part of an energy counseling, this helps your conscious mind recognize what was released and be fully ready to move on from being weighed down by whatever blocked energy was causing the issue in the first place. A lot of the results are often quite mind-blowing and take some time to settle in. Much of what we find is simply irretrievable by conscious memory, but deeply resonate on a subconscious level. Almost always, there are at least several things we find that clients consciously recognize as being incredibly accurate and are consciously very validating of the work. Q?Do you diagnose or treat diseases? We are not doctors. We do not diagnose or treat diseases. You should always consult a board-certified physician regarding any complaint of a medical nature that you may have. We’re more like messengers, reporting back to you what your body tells us it needs and what it’s ready to let go of. The care and counseling Intuitive Being provides you should be considered supplementary to any primary medical care that may be appropriate for you. Q?What tools do you use during sessions? +We use anything that moves energy. We use anything that moves energy. This might be our hands alone, but typically will involve the use of sources of magnetic energy. 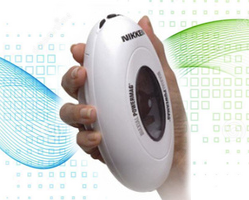 We primarily use the Nikken PowerMag, an incredibly powerful tool that electrically spins two magnets, emitting a strong magnetic wave that permeates the body. It makes a quiet vibrating sound, which is nice if you’ve drifted into a slumber while you’re on the massage table. If the PowerMag is too powerful for you, we may turn to a MagBoy, which also works by spinning two magnets (biaxial rotation). These are spun by hand, and so emit a smaller magnetic field and can be more easily controlled. If your body tells us that neither of these are resonant for you, or risk causing ill side effects (see the Side Effects FAQ), we may turn to an even smaller magnet that we use by hand, or employ other objects known to move energy, such as black tourmaline. Often, hands alone can move energy with the right attunement. Our primary “tool”, of course, is Applied Kinesiology itself, which requires nothing but muscle testing and some fingers. Q?Are there any side effects from sessions? There are few side effects to anything we do; and none that are significant, anything beyond highly transitory, or pose any danger or risk to you. The key is to be mindful of this as a possible outcome of our work together. Be aware of your thoughts and any strong emotional reactions you may feel yourself having, and remind yourself that it is not actually “real”, but is an echo of that emotion leaving you. Mostly, the side effect of Emotion Code work is some initial processing as the conscious mind lets go of baggage, followed by a feeling of lightness afterwards. Some people are sensitive to magnetic energy. They might experience a headache, stomach ache, or other low-level physical response to exposure. As we typically default to using powerful magnets during sessions as the primary tool for releasing stuck emotions and energies, we always make sure we ask your body first if magnets are okay for you. If they’re not, we don’t use them. There’s other tools we can use, such as minerals, crystals or any other object that serves as a conduit for energy. Sometimes, just fingers and intention work well enough by themselves.